To treat your tooth loss, you made the choice to invest in your smile with dental implants in Colorado Springs because they offer over a 95% success rate. While you have been satisfied with your results, you have recently felt like something just is not right. You suspect that your dental implant may be loose. There are several signs that can indicate a problem with it. If any of them occur, it is vital you see your periodontist right away for treatment. Discomfort or Pain: Pain and discomfort are normal after your initial implant post was placed; however, if it suddenly develops, it is a warning sign that there may be a problem brewing. If pain or discomfort recently develops, especially long after the post was placed, it is vital that you call your implant specialist in Colorado Springs right away. Swelling and Inflammation: You may see noticeable swelling, inflammation, or redness of the gum tissue, which may indicate an infection. An infection is the leading cause of dental implant failure, which is why it is important to maintain your oral hygiene and regular preventive visits with your dentist. Feeling Loose: In some cases, you may just feel like your implant is loose, such as when biting or chewing. You may even be able to actually feel it wobble. This can be due to bone loss or another underlying problem. Your periodontist will find the cause of the complication to provide the appropriate treatment. With a proactive approach to your oral hygiene, complications with dental implants are rare. However, to ensure their success from the beginning, it is important to choose an implant specialist who is qualified and experienced in the procedure to promote the correct placement of the posts. With the right placement and proper oral health, your risk for implant failure is rare. However, if a problem does arise, it is best to contact your dentist right away. With quick action, restoring the function of your dental implant could be as simple as antibiotics, but if you wait too long, it could result its removal. Do not wait until it is too late. Call your implant dentist right away if you suspect that your dental implant is loose. Rocky Mountain Periodontal Specialists is committed to restoring oral health through advanced treatments. In addition to repairing teeth and treating infections, they offer tooth replacement solutions with dental implants. 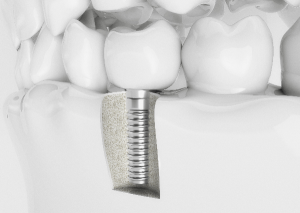 If you have developed a complication with your dental implant, contact Rock Mountain Periodontal Specialists today to schedule an appointment.